Bell Telephone H. M. Whitman, Mgr. 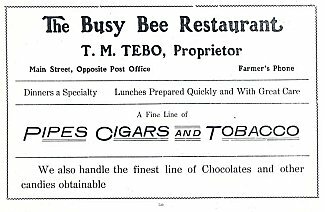 Busy Bee Restaurant T. M. Tebo, Prop. Clinton Bakery W. R. Douglas, Prop. Canton Carriage Works R. J. Dunbar, Prop. 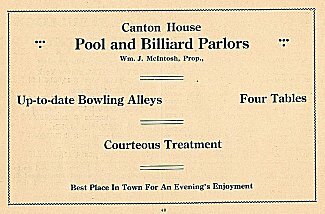 Canton House Pool Parlors W. J. McIntosh Prop. Canton Marble Works E. J. Bailey, Prop. Canton Market House M. J. Brague, Prop. Farmers Telephone Co. F. A. Rider, Mgr. 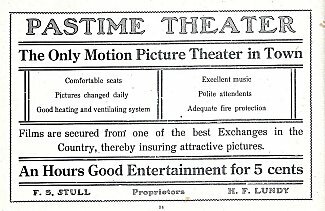 First National Bank L.T. McFadden Cash. Hotel, Packard H. B. Drake Prop. McCarthy’s Restaurant M. E. McCarthy, Prop. Park Hotel D. A. Smith ,Prop. Wirth’s Cigar Co. Cigar Mf’rs. When first known to the whites, Bradford County was subject to the Iroquois of central New York. On the river were a few miserable villages where mingled together the remnants of different tribes from the southward, whose lands the Iroquois had sold to the white man. This place is one of the great Indian "paths" coming up Lycoming creek from the West Branch and from here down Towanda creek to the river. They were hunters, ambassadors, warriors, the Indians who drank of the springs at Minnequa or launched their canoes on the waters of Lake Nepahwin. In 1737 there came up the trail the first white man, Conrad Weiser, an ambassador from the government of Pennsylvania to the Iroquois. He gives a general description of the woods from the Loyalsock to Sugar Creek but nothing which can positively be identified as referring to Canton. But in 1743 John Bartram, a noted English botanist, and Lewis Evans accompanied Weiser on another journey and the journal of that expedition expressly noted the "beaver meadow" at Grover, and the hickory groves that characterize this part of the Towanda valley. Canton Borough was formerly a part of the township known as "Canton Corners." The township was so called from a Connecticut township of that name, for the original settlers here held under the Connecticut grant. The first settlement in Canton Township was probably in 1794 by Isaac Allen. The first settler in what is now the borough was Jonathan Prosser, a German, in the spring of 1796. His cabin stood near the Sullivan Street bridge. Jacob Granteer bought out Prosser in 1800. He was a native of Lorraine and a Revolutionary soldier. His farm of 440 acres comprised most of the present borough. 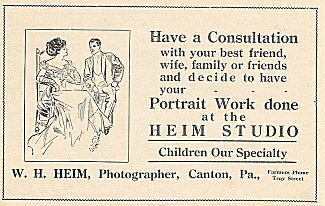 His house of hewed logs stood about where the Newman house now stands on Lycoming street. His eldest son, John Granteer, cleared the ground on which the borough stands. Capt. C. S. Sellard bought the farm in 1828. He lived about where Hotel Packard is now and his home was for years the only place of entertainment here. Descendants of both Granteeer and Sellard are still among the prominent inhabitants of the borough. 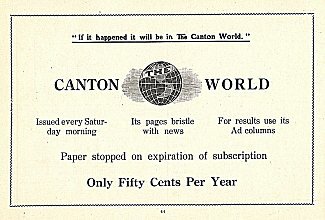 It is hard now to realize that "Canton Corners" was a one time a rival of the little village of East Canton. 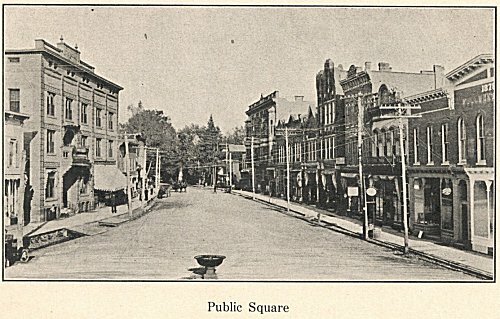 The building of the state road from Williamsport was an event in the lives of our fathers; the Northern Central railway made the "Corners" the undoubted center of this district. The history of the borough has been one of gradual growth. In 1820 the township had but 569 population, and in 1830, 1175. In 1850 this had grown to 1746; in 1860 to 2190. In 1864, Canton and Alba Boroughs were set off from Canton township. The population of Canton borough in 1870 was about 850; in 1880 it was 1194; in 1890, 1393; in 1900, 1525. At the last census in spite of the fact that most of the growth of the town was just outside of the borough limits the figures had become 1637. When we consider that so many towns have decreased, these figures spell one word: P E R M A N E N T. Canton is a town with a future. 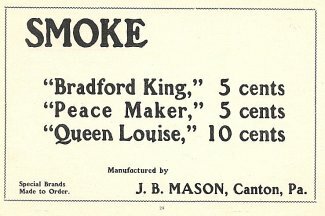 The principal factories of Canton are the Belmar Mfg. 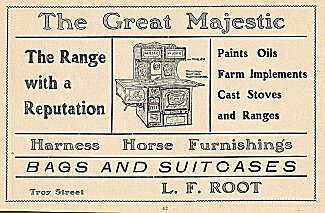 Co., clothes-hangers; W. W. Gleckner & Sons Co., wholesale harness and horse goods, The Minnequa Furniture Co., extension tables; H. Sheldon Mfg. Co., flag sticks, map rollers, fan handles, etc., and The Swayze Adv. Co., folding boxes, signs, calendars, and advertising novelties. 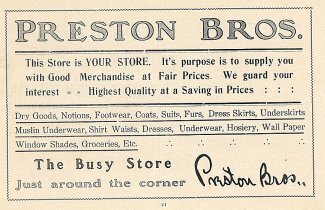 The town has two grist mills: H. Rockwell & Son, and Preston Brothers; one saw mill: H. Crawford & Sons, three automobile garages that do repair work: Canton Garage and Machine Co., J. W. Crawford and Ralph Lyons. In connection with the former is a machine shop that makes special machinery on order. 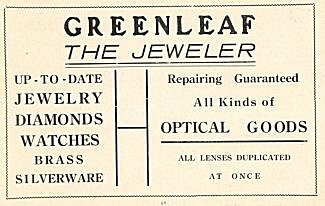 The up-to-date electric light plant, and two telephone companies, each with a large number of subscribers, furnish employment to electricians and linemen. All these industries have brought the town into prominence as a shipping point. In addition it has always had its share of the shipments of butter and dairy products for which Bradford County is famous, and the great increase in recent years of the poultry and egg farms in its surrounding country have raised these shipments to large proportions. The number of car loads of potatoes, apples, grain, etc., that go out of this station would surprise most residents.